During three days, the city of Concepcion gathered more than 200 experts from around the world to exchange knowledge and experiences on new uses of materials from the forest, countryside and the sea. The Congress consisted of three activities, 3rd Iberoamerican Congress on Biorefineries (CIAB in Spanish), 4th Latin American Congress on Biorefineries and 2nd International Symposium on Lignocellulosic Materials, between 23 and 25 November 2015 in Concepción. It was a complete success because more than 200 researchers and professionals related to biorefineries participated creating a motivating atmosphere to exchange knowledge and experiences. The Congress on Biorefineries was the most important annual event in the area of bioeconomy of the America continent and was attended by some of the world’s leading experts in this field. They discussed and analyzed the latest scientific and technological advances in new uses of forest, agricultural and algal biomass, not only for energy, but also as raw material for fine chemicals and biomaterials. The relevance of working on this research is substantial to gradually replace fossil fuels: oil, coal and natural gas, which our society needs. 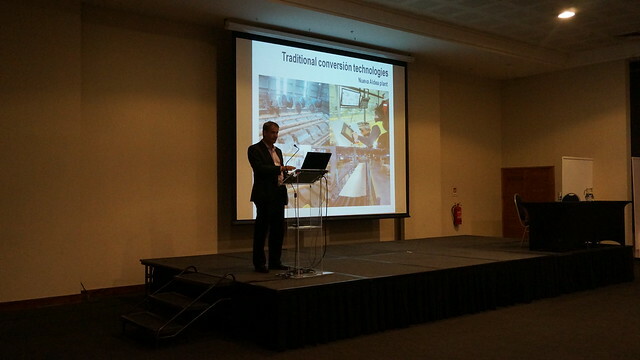 The Congress was the opportunity to “start and strengthen collaboration networks with researchers and business representatives from around the world and lay the foundations for a new productive reality”, said Alex Berg, Director of the Technological Development Unit (UDT) of the Universidad de Concepción and President of the Organizing Committee of this initiative. This “new productive reality” will lead to the bioeconomy era, a revolution in the way of production seeking to use raw materials fully and sustainably, respecting the environment and involving the community in the decision-making related to the productive activity. The Biobío Region should play a leading role in this productive change as “bioeconomy offers excellent opportunities for the Biobío Region, given its natural environment, the importance of agriculture and forestry, and the presence of research and development capabilities of excellence. The transition from the current regional productive structure, characterized by a strong presence of heavy industry, to an era of sustainability, characterized by high technological sophistication, high value-added products regarding the environment and inclusion of society on paradigm shift benefits mentioned, it is an urgent task, in which the bioeconomy will be a major player”, said Dr. Berg. 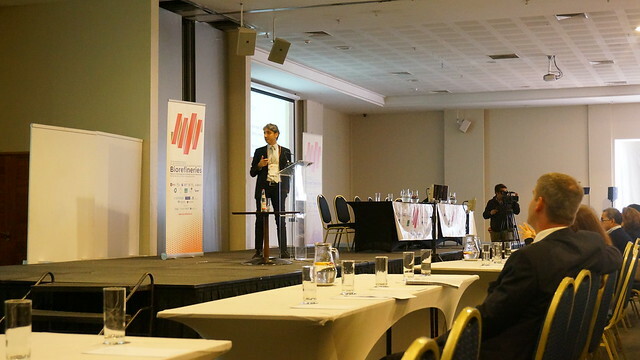 The Congress had 11 keynote speakers, leading worldwide researchers who delivered plenary lectures and led the discussion related to the main topics addressed. They are experts from Europe, US and Latin America, highly recognized for their contribution to scientific knowledge and global technological development. The Congress on Biorefineries was organized by the Technological Development Unit, UDT, the Biotechnology Center, CB-UdeC, both from the Universidad de Concepción; Iberoamerican Network on Pulp and Paper Teaching and Research, RIADICYP; Iberoamerican Society for the Development of Biorefineries, SIADEB; CYTED PROVALOR network; Scientific and Technological Center on Bioresources, BIOREN of the Universidad de la Frontera, and the VTT company, Technical Research Centre of Finland Ltd. 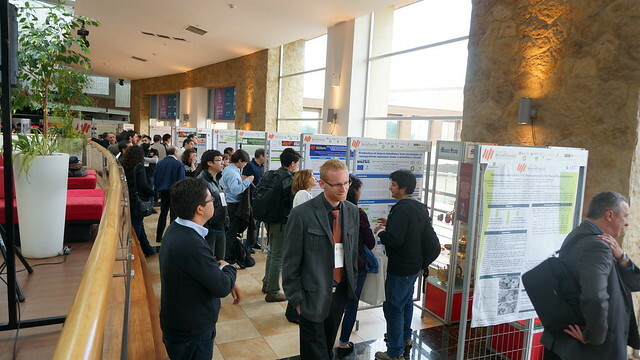 In all, there were more than 250 participants, including researchers, company professionals, public sector representatives and students, both Chilean and foreign. Significantly, 17 countries were represented from America, Europe and Asia. 203 abstracts were received, of which 54 oral presentations and 89 posters were selected and presented. Oral presentations were divided into 10 sections, which were distributed during the two and half days of the Congress in two parallel sessions. These working sections included cellulose microfibrils, chemical, biological and thermochemical conversions of wood, innovative bio-based materials and new technologies relating to the production and use of bioenergetic materials. The visitors, especially foreigners, positively highlighted the quality and standard of papers presented and the enthusiastic and motivating atmosphere during events, boosting the fruitful exchange of ideas and experiences. Among the technical conclusions, the confirmation that the replacement of oil by renewable raw materials is beginning to occur productively in various countries and that Chile can be a pioneer in this regard can be highlighted. “The forest and agriculture provide the Biobío region with a unique opportunity to establish a new industry with high added value, based on waste from existing productive activities. They are high value products such as nutraceuticals and other fine chemicals from biomass; biodegradable or functional plastics and resins of various kinds, among others, derived from their components; and biofuels, either to generate heat, electricity or feed a motor”, says Alex Berg. In order to establish biorefineries in the market, it is necessary to have the determined and coordinated action of companies, research centers and a suitable environment, together with natural resources, to bring these developments to the industrial reality. Among the great advantages offered by this new productive paradigm, the environmental sustainability and real possibility of involving companies of different sizes, particularly new technology-based entrepreneurships, can be highlighted. For this to materialize, there is broad agreement that a social consensus must be achieved, in which the State participates, fulfilling functions of political and strategic leadership; companies, as production and technological innovation engines, and universities and research centers, contributing with their knowledge and future view.